Is one of the best Software House in Islamabad Pakistan for every kind of online Business Solutions. A company website or portfolio is the best way to help customers find you and create an official home online. CodeAge Pakistan is providing one window solution for all online businesses. The increasing demand for online business and services ask for instant and efficient solutions, and that is exactly what we are offering at CodeAge. It is Best Software House in Islamabad Pakistan. 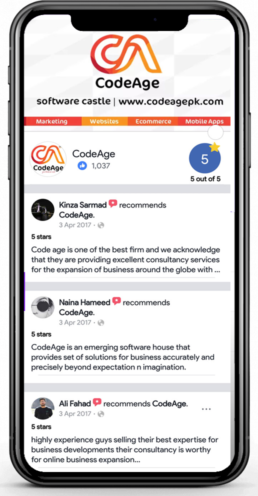 CodeAge, is one of the leading software houses in Islamabad and offers Website Development, Apps Development, SEO services, Digital Media Marketing and provide very cheap rates of Domain and Hosting services. We are always ready to provide an unparalleled quality of services to our clients and guide them thoroughly regarding their websites and online business. In today’s digital world, website is the necessary for every online business. Without website, you cannot meet the demands of the market.In CodeAgePK which is best software house in islamabad.We have very hardworking and very technical team that is ready to provide all website solutions and best services to our clients 24/7 .Our Professionals have an experience of more then 7 years, that's why CodeAgePK is the best software house in Islamabad Pakistan. Social Media Marketing, Email Marketing, and Internet Campaigns. Increase your sales with our Google top ranking strategies.